Perhaps you remember*, as I do, the first time you read Poe’s “Murders in the Rue Morgue,” this story of a double murder that the newspapers quoted in the text say is “so mysterious, and so perplexing in all its particulars” and that the narrator qualifies as an “insoluble mystery” (351), when you discover at the end that the murderer is an ourang-outang. Upon learning that the perpetrator is a beast not exactly known for its intelligence, I couldn’t help a little smile, a smile of self-derision for having been pulled in by quite a complex suspense involving a body with a cut throat found in a court yard, another stuffed up the chimney of an apartment with absolutely no trace of a forced entry or exit and where jewelry and a large sum of money are lying on the floor, and voices heard, one a “gruff” of a man undoubtedly speaking French, and another, a “shrill” in an undeterminable foreign language, to name just a few of the indices presented in the tale. That smile is perhaps also a smile of amusement, if not of pleasure, for having been the object of a little mystification. A mystification not unlike the one for which fell James Sherwood, this amateur of unique objects in Georges Perec’s La Vie Mode d’emploi who in the New England of the 1890’s paid one million dollars for the supposed vase in which was collected the blood of Christ, only to discover that it was “une espèce de gargoulette achetée dans un souk de Nabeul (Tunisie) et légèrement maquillée” [a kind of earthen vase bought in a souk in Nabeul (Tunisia) and slightly made up]. The narrator tells us however that in the end Sherwood knew very well “qu’il ne payait pas pour le vase mais pour la mise-en-scène”  [that he was not paying for the vase but for the show]. But why an ourang-outang? There is, of course, a less frivolous reason for Poe’s choice than pulling a trick on us. We’ll see that this reason is not without a connection to the very concept of mystification. It is in fact with the help of another mystification, this one a real hoax, that an answer will become apparent. I’m referring to “Maelzel’s Chess Player,” an article Poe wrote a good five years before the “Rue Morgue” in which he plays himself the role of the detective. The chess player is an automaton invented by Baron Van Kemplen in the late 18th century. 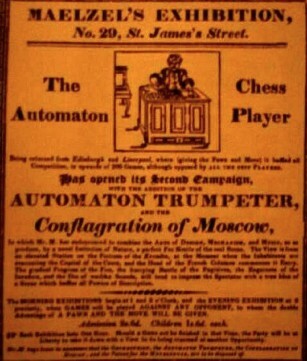 It was subsequently purchased by a certain Maelzel –the inventor of the metronome– who exhibited the machine’s prowess by having it play opponents from the audience at theaters and sideshows on both sides of the Atlantic. In the article, Poe demonstrates, as others by the way did before him, that hidden in the machine was human being who is actually doing the chess playing. 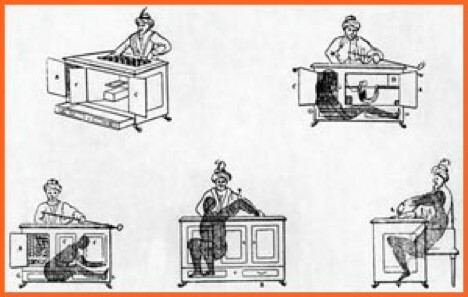 the stage rolling the automaton in front of him while opening and closing compartments and drawers in the machine to show that it contained only mechanical elements. Poe proposes that Maelzel opened and closed these compartments and drawers in a precise order that permitted the person inside to slide an inner panel and move around at the right moment and thus remain hidden. He concludes that, in spite of the mechanics of the machine always in view, there remained always a locked space inside the machine. — This inner sliding panel constitutes part of Poe’s solution to the hoax in the article. It is transposed to the tale where it becomes a sliding window that also constitutes part of the solution to the locked room mystery for Dupin. We find out that the ourang-outang enters the apartment through such a window and by chance a nail in the window frame locks the window upon its exit. The animal, in other words, like the supposed person inside the machine, moves around thanks to a sliding mechanism and thus remains hidden to the neighbors who arrive on the scene just as the murder was taking place. — The structures of the article and the tale are also very similar. Both start with a long, general, abstract, and to a certain extent epistemological discussion which then turns to a concrete description of the automaton in the article and into a narrative in the tale which is supposed to illustrate the epistemological discussion. Moreover, the epistemological discussion in both are precisely on the same topic, but taken from slightly different angles. In the article, Poe distinguishes the functioning of a machine and the nature of human thought. In the tale, which has very much the appearance of an article in the beginning, Poe distinguishes mathematical analysis from human analysis, between the computable and the thinkable. This distinction is summarized by an aphorism that we find in the first few lines of the tale: “Yet, to calculate is not in itself to analyze.” I think that we can read the three Dupin stories as an unpacking of that aphorism. The second tale, “The Mystery of Marie Rogêt,” is labeled clearly as sequel to the first, not in the plot, of course, but in his further development of the aphorism where he will talk mostly about probabilities. In the third tale, “The Purloined Letter,” he will have Dupin pick up explicitly the difference between the thinkable and the computable, to which I will come back. –Around the same time, Ada Lovelace Byron, Lord Byron’s daughter, is getting her training in mathematics from Babbage and is working with him to develop the second generation of his machine, called –note the coincidence—the “Analytic Engine” for which she wrote what is considered today as the first piece of software that was to generate the Bernoulli numbers. She writes a few years later to a friend this exquisite sentence: “I hope to bequeath to generations a calculus of the Nervous System.”  Her remark is certainly not as ambitious as her elder’s substitution of mind by matter, but it fits nevertheless within the paradigm because, as we shall see in moment, if there is such a thing as a calculus of the nervous system, that calculus is susceptible to mechanization. We are indeed not very far from Ada’s exquisite sentence about the calculus of the nervous system. If such a calculus can be built, a machine can also be built to perform such a calculus. With Poe’s argument that any mathematical procedure is in theory susceptible to mechanization, we are not far either from what is known today as the Church-Turing thesis, which states “for any given algorithm there is some Turing machine that can implement that algorithm.” I’m taking this formulation from a 1990 article by John Searle whose title, “Is the Brain a Digital Computer?” , shows perhaps glaringly that we haven’t yet settled the debate on the possibility of machines doing any kind of thinking. Poe’s article on “Maezel’s Chess Player”, its transposition in “Rue Morgue” and the extension of that tale into two more tales to make up the Dupin stories, are written however in opposition to that tendency to believe that the mind is ultimately susceptible to mechanization. The aphorism at the beginning of “Rue Morgue,” “Yet to calculate is not in itself to analyze,” declares that opposition succinctly and clearly. When we put it together with what he said in the article on the chess player, we understand that in that sentence, to calculate is certainly what a machine can do –the computable– and to analyze is what humans can do—the thinkable. The Dupin stories are, in effect, a demonstration of the thinkable, taking as an illustration the extraordinary mental exploits of the Chevalier Dupin. And it is, of course, by the same type of reasoning that the Minister hides the letter in plain sight (or in the plane of the ordinary) and that Dupin finds it. 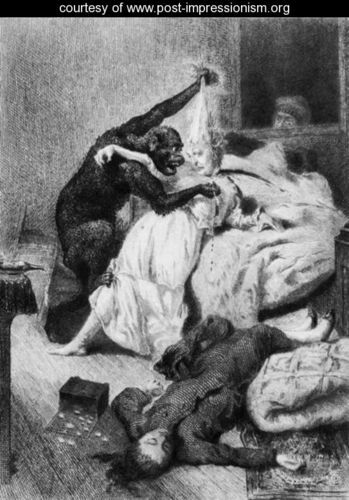 However, two other components of the thinkable are of particular importance in our attempt to come up with an answer our question “Why an Ourang-Ouang?” The first is mentioned at the beginning of “Rue Morgue”. It occurs when “the analyst throws himself into the spirit of his opponent, identifies himself therewith, and not unfrequently sees thus, at a glance, the sole methods (sometimes indeed absurdly simple ones) by which he may seduce into error or hurry into miscalculation” (334). Dupin demonstrates this identification with the other –what else to call it but “empathy”? –when, after a long silence during a walk, he finishes a sentence that the narrator had started in his mind. He demonstrates it also when, in a long speech in the first person in the same tale, he goes over the reasoning of the sailor who had lost his ourang-outang, as though he was himself the sailor (369.) In “The Purloined Letter” he invokes empathy again when he tells the story of this kid who always won at the game of even and odd by identifying with his opponent, going as far as taking on his facial expression in order, supposedly, to know better what he is thinking (451). Dupin finally uses the same empathy with the Minister, mimicking his thoughts, to understand that the letter was hidden in plain sight. Poe also practices that empathy or practiced it five years before Dupin in order solve his own mystery of the Chess Player. But here, he doesn’t finish a sentence for someone or go through a supposed reasoning of an adversary. His empathy does not have much to do with identification with a mind. He traces, rather, and with great details, the body movements of the human chess player hidden inside the automaton as Maelzel parades his machine on the stage while opening and closing its doors and drawers. This empathy has a long history when it comes to automatons and machines of all sorts. I’ll just mention a few. The first dates to 1816 and is to be found in E. T. A. Hoffmann’s “The Sandman,” when Olimpia, the automaton, answers every one of Nathanel’s questions by the same “Ach! Ach!” and he understands every time whatever he wants to understand, that she likes his poetry, that she loves him, etc. Nathanael, in fact, identifies with Olimpia and supplies her with the answers that he says himself. Olimpia’s “Ach! Ach!” is not without reminding us of the Raven’s “Nevermore”, repeated at every question or statement put to it and taking on a different meaning with each repetition. That meaning however, is not intended by the raven but supplied by the poet and the reader who identify with the bird and assign to it a supposed different meaning. As a matter of fact, in both cases, we can say that if the machine or the bird do any thinking at all, it is thanks to the empathy of human beings, Nathanel’s, the poet or or the reader, who do the thinking for the automaton or the bird. Another way to put it is that the machine uses Nathanael as a prosthesis to do its thinking and the raven uses the reader and poet to do its own, just like Maelzel’s automaton uses the human being inside it, as well as the gullible audience, as prostheses to do its thinking. Another example comes from the end of 19th century in France, in Villiers de l’Isle Adam’s L’Eve Future (Tomorrow’s Eve). It is also empathy that enables the main character, Lord Ewald, to confuse Hadaly, the Andréid (it is Villier’s word) that Thomas Edison (yes, our own Thomas Edison) has made for him to take the place of Alicia, the woman he loves. Toward he end of the novel, the Andréide tells Lord Ewald in the most natural way those few magical words: “Ainsi, tu souffres, dit-elle tout bas, et c’est par moi “ (Thus you are suffering and it is my fault). The narrator then adds: “cette seule parole humaine avait suffi pour toucher toute son âme” (these human words were enough to touch his entire soul). It is finally that same empathy that will become in modern science fiction what distinguishes humans from machines. I’m thinking in particular of the scene at the beginning of Blade Runner when the authorities, in order to distinguish humans from cyborgs, test the citizens’ sense of empathy by asking them what they would do if they saw a turtle on its back. The narrator, who is good at “fancy” but probably not at imagination answers “a madman.” He is close but not quite on target. He identifies an irrational mind while the murderer is almost entirely a body. To convince the narrator, or maybe to teach him some detection, Dupin does not invoke anything having to do with the mind such a motive, a calculation or a ruse (how could he? there is hardly any mind involved) but asks the narrator to do a kind of empathic gesture consisting in comparing the extent of his own hand with that of a facsimile of a hand’s imprint that was left on one of the victim’s neck. Or to put another way, the assassin being almost entirely a body, the indices it leaves can only be corporal. It is perhaps clear that the procedure here is fundamentally mathematical: divide the house of the Minister in small parts –I’m tempted to say “cells,” number them in order not to miss any and examine one by one with a microscope. The assumption here is that they will have thus searched the whole house but in fact they will have only searched the sum of all its parts. A sum that is of course computable and in another register mechanizable. Regarding these cells, I think it is not too much to say that the Prefect transforms the house into a database and looks for the letter –with a microscope– in each one of its cells. and upon insisting with the question, comes a reply that has been often commented upon: “Yes; –no; I have been sleeping –and now–now–I am dead” (277). I would like to propose that Poe was continuing here his reflection on computability and incomputablitly by setting up circumstances where “yes” and “no” mean the same thing, where, in a tiny phrase are conjoined the affirmation of existence, the “I am” and its negation “dead.” With this tiny phrase, Poe has also given a test for incomputability. According to Roger Penrose, you have incomputability of a problem when you can prove that no question exists that will give you a simple yes or no answer to the problem. Indeed, any question we can put to Valdemar to determine if he is dead OR alive will be answered by an AND. Dead and alive, asleep and awake, “yes” and “no” or, in modern computer terms, the impossible 0 and 1. The lesson here is that a “yes” AND “no” is certainly thinkable, the short story is proof of that, but not computable and therefore not susceptible to mechanization. It is perhaps clear by now that –or at least that’s where I was coming to by gathering these remarks– that Poe, in transposing or translating or even monkeying his article on the Chess-Player into a tale about a double murder, has replaced the interior mechanisms of the automaton by another body with almost no mind in a similar locked room situation. Poe, however, needed a body, incapable of analysis of any kind, whether mathematical or human, a body, and not a mind, that did not require too much suspension of disbelief for his mid-19th century audience (we are not quite yet in the 20th century and Hal the murderous computer has not seen the light of day). That body is the ourang-outang, which resembles humans and which imitates humans, just as the automaton imitates a human playing chess, or more precisely, which gives the appearance of a human playing chess, without, that is, any trace of empathy for humans. We learn, as a matter of fact, that the owner of the animal in the tale had caught it imitating him shaving. It is imitating but not empathizing. Why then an ourang-outang? In order to demonstrate, just like he did in the article, that the appearance of intelligence is not in itself intelligence. Poe is thus giving an anticipatory answer to Allan Turing and his test. In his now classical article of 1950, “Computing Machinery and Intelligence,” Turing set out, just like Poe a century before him, to establish the conditions of possibility of machine intelligence or what we call today AI. To simplify his task, he proposes to replace he question “Is a machine capable of thought?” by a game, which he calls, of all things, “The Imitation Game.” And here we have all over again, a century later, show business (remember that the chess player was displayed in theaters and side shows), games, imitation or monkeying, just like the ourang-outang imitating his master shaving and just like Poe imitating himself. Briefly, the game consists in putting behind a curtain a machine and a human being (and here is the locked room reappearing as if by some trick.) In front of the curtain there is a person who asks questions to the entity behind the curtain. The answers come back to the questioner in typewritten form. The questioner has therefore no way of knowing if the answers come from the human being or the machine. If the questioner cannot, statistically speaking, distinguish the human from the machine answers, we can ostensibly conclude that the machine was successful in imitating human behavior. Turing goes a bit further and says that the machine “carries out something which ought to be described as thinking but which is very different from what man does” (435). Today we say that the machine passed the Turing test. It is clear: Turing sidesteps the question on the machine’s capability of thought. Whether it is capable of thinking or not is no longer the question. It is only its behavior that counts and whether this behavior could be described as thought. Turing is satisfied with the appearance of thought, its imitation, its monkeying. But, as we saw, that is not enough for Poe. It is not enough for John Searle either. In his also now classic 1990 essay, “Minds, Brains and Programs,” he imagines a mind experiment that came to be called the “The Chinese room experiment” (here comes the locked room again). In order to determine whether a machine is capable of thought, Searle imagines in this virtual experiment exactly what Poe has done with the chess playing automaton: he goes inside the machine and imagines doing exactly what the machine is supposed to be doing in giving its answers (and here are our friends empathy and mimicking reappearing). The machine with Searle inside is given a text written in Chinese and a series of questions also written in Chinese about that text. He is to answer these questions also in Chinese, a language he does not know. He is also given a set of rules, a user’s manual or an “algorithm” if you prefer, in English, a language he knows well. The set of rules allows him to recognize the Chinese characters, without, of course understanding them, and to manipulate them. In following these instructions, in doing everything “by the book,” as Poe says about the whist player, Searle manages, of course, to answer all the questions put to him without any understanding of the original text, or the questions, or his own answers. He concludes that it would really be difficult to say that there was any kind of thinking going on inside the machine. Just like the ourang-outang who imitates his master shaving or kills two women in their apartment in Paris without really understanding what it is doing, Searle manipulates signs and rearranges them without understanding a word of the material he is manipulating. In essence, he is doing body work inside the machine but no mind work. From the outside of the locked rooms, be it the computer Searle is in, or the apartment in “Rue Morgue” without any signs of entry or exit, or even the locked room of the compartment that houses the human chess player, from outside of these locked rooms, it looks like there is intelligence at work. What comes out of these rooms can indeed as Turing says “be described as thinking.” If however we unlock these rooms, we realize that we have been the object of a mystification, not unlike the mystification we were subjected to upon reading for the first time “The Murders of the Rue Morgue” and in which we took a certain pleasure. * This article picks up and develops some of the argumetns of my “Poe: Expérience de pensée. La pensée comme expérience”, Épistémocritique, Vol. II, Hiver 2008. It is featured here as a prepublication of a chapter in POEtiques/POEtics, l'influence de Poe sur les théories et les pratiques des genres dans le domaine français, Nicole Biagioli, ed. Hermann, 2010. Edgar A. Poe, “The Murders in the Rue Morgue” in The Portable Poe, Philip Van Doren Stern, ed. Penguin, 1945, 350. All subsequent references to Poe’s work are to this edition. Georges Perec, La Vie Mode d’emploi, Paris, Hachette, 1978. All translations are mine. There are numerous references to Poe in Perec’s work. There is for example in the same La Vie Mode d’emploi a detective named Waldemar that Perec writes, of course, with a “W” (Perec is the author of a bit-part autobiography W ou le souvenir d’enfance), a “W” perhaps inspired by Poe’s “William Wilson,” where we have a literal double YOU. There is also that oblique vision so fundamental in Perec’s work, which Poe describes in “Rue Morgue”. He explains that “to look at a star by glances—to view it in a side-long way,” “there is a more refined capacity for comprehension” than in a “scrutiny too sustained, too concentrated, or too direct” (352). A last example would be a game described in “The Purloined Letter” (457), where the player is asked to find a name on a map, the most difficult being those printed in large typeface to designate large areas. Perec builds an entire episode of La Vie Mode d’emploi on the same principle (454-464). My question echoes, unwittingly, Chico’s “Why a duck?” which, on second thought, is not totally unrelated to mine, when you consider that one of the first realistic automaton is a defecating duck (see Jessica Riskin, “The Defecating Duck, or, The Ambiguous Origins of Artificial Intelligence”, Critical Inquiry, Summer 2003, Vol. 29, No. 4) and that Maelzel’s chess player, a topic that will occupy us in a moment, is undoubtedly a close descendant (a G2?) of that duck. Anonymous, “ART III,” The British Critic, October 1822, Vol. XVIII, 362. John W. Draper, “Lecture. The last of a course of lectures, delivered during the years 1838-7, in Hampden Sidney College ; on the occasion of the award of an annual prize, given to the members of the Junior and Senior Classes,” Southern Literary Messenger, Vol. III, No. XI, 696. Interestingly, Poe describes that same step by step procedure in writing “The Raven” and goes as far as to say in “The Philosophy of Composition”: “It is my design to render it manifest that no one point in its composition is referrible either to accident or intuition — that the work proceeded, step by step, to its completion with the precision and rigid consequence of a mathematical problem” (551-552.) Although modern poetry, more specifically the OULIPO group, will put to work this somewhat mechanical and mathematical process of composition in very inventive ways, any reader of Poe’s poem will agree that there is much more to that poem than the “consequence of mathematical problem.” I like to think that Poe’s essay is not written tongue in cheek as has been suggested but that the algorithmic step by step procedure he describes is used as an analogy to emphasize the idea of design, if not of engineering, in writing a poem, which was picked up quite seriously by poets such as Paul Valéry. See for example his “Poésie et pensée abstraite” in OEuvres, vol I. Ed. Jean Hytier. Paris: Gallimard, Bibliothèque de la Pléiade, 1957. John R. Searle, “Is the Brain a Digital Computer?” Proceedings and Addresses of the American Philosophical Association, Vol. 64, No. 3 (Nov. 1990), pp. 21-37. In “E.A. Poe: Expérience de pensée, la pensée comme expérience”, Europe, No.868-869, Août-Septembre 2001, 175-185 (also available at http://www.epistemocritique.org/?p=45), I delineate some of the necessary components of thought that Poe reveals in trying to understand Dupin’s analytical mind. See Paul Harris, “Poe-tic Mathematics: Detecting Topology in 'The Purloined Letter,'” Poe Studies/Dark Romanticism: History, Theory, Interpretation, vol. 36, 2003,18-31, for a discussion of the topographical implications of that letter that has undergone an eversion, that was folded, that is, inside out. It could be argued that the process of empathy as described by Poe resembles that everted letter. The “analyst” folds out, so to speak, his opponents mind in order to read it. Villiers De l’Isle-Adam, L’Eve future, Paris. Gallimard, Coll. Folio, 1993, 305. My Translation. Andy Clark, Being There: Putting Brain, Body and World Together Again, Boston, MIT Press, 1997, 108. One can undoubtedly detect in this last quote another eversion. 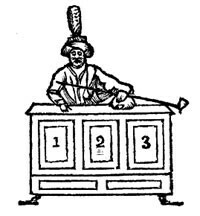 The whist player’s analytical powers act as though the other players’ hands were turned inside out. Or if you take “faces” as the actual player’s faces, it is as though their minds are turned inside out to be displayed on their faces. Penrose, Roger, Shadows of the Mind, Vintage, 1995, 29. A.M. Turing, “Computing Machinery and Intelligence”, Mind, Vol. LIX, No. 236, October 1950. John R. Searle, “Minds, Brains and Programs”, in The Philosophy of Artificial Intelligence, Margaret Boden, ed. Oxford UP, 1990.